People say the nicest things. My wife recently died from cancer & Parkinson. She was cared for by your wonderful dedicated staff who were marvellous, who came 4 times a day. As I recently had a minor stroke it was impossible to do without them. 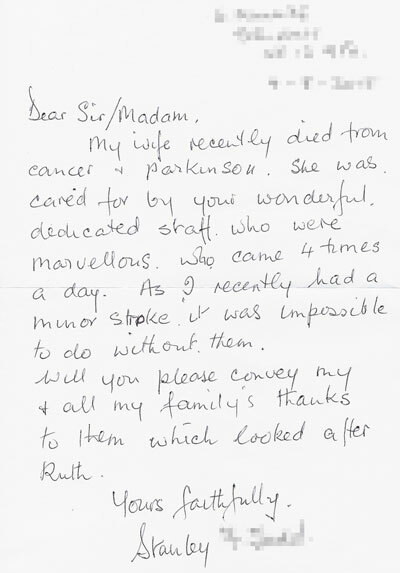 Will you please convey my & all my family’s thanks to them which looked after Ruth. Thank you to everyone who helped me to care for my husband during the past few months. Due to your care, kindness and support, was able to remain at home until the end of his life, as was his wish. A special thanks to the “regulars” – Michelle, Karen, Vicki, Nick, Paula, Daphne, the two Charlottes, Chloe and Siphiune who is so capable and caring and enabled me to have some much needed rest. 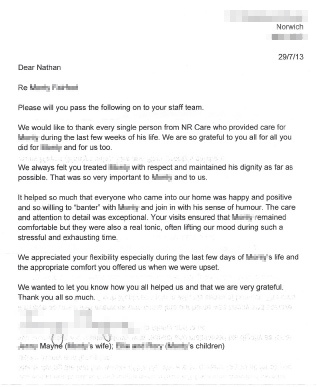 I should like to take this opportunity of thanking you for the excellent service NR Care gave. 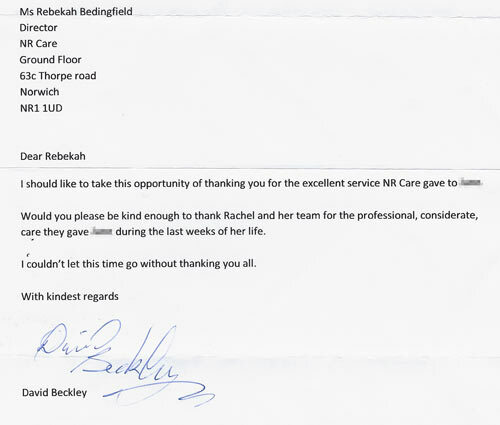 Would you please be kind enough to thank Rachel and her team for the professional, considerate, care they gave during the last weeks of her life. I couldn’t let this time go without thanking you all. I would just like to thank you and all your carers for the wonderful way they helped my husband in the final weeks of his life, he looked forward to seeing them every day. They also gave me great comfort + support. Each and every one of them deserve a special thank you, we were so blessed to have met them all, and would recommend them to anyone who may need help in the future. I would like to express my very sincere appreciation for the level of care my brother has received. Nathan and Rebekah, together with their workers, have been outstanding. They are totally professional, punctual, well organised and efficient. Over and above this they have demonstrated a level of caring commitment to my brother, the patient. Our overriding aim has been to maintain his dignity and they have greatly contributed. 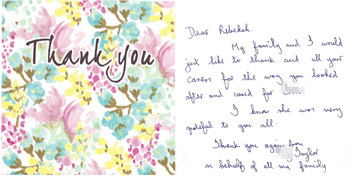 My family and I would like to thank you and all your carers for the way you looked after and cared for (patient). I know she was very grateful to you all. 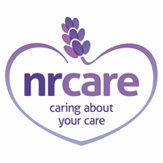 We would like to thank every single person from NR Care who provided care for my husband during the last few weeks of his life. We are so grateful to you all for all you did for (patient) and for us too. 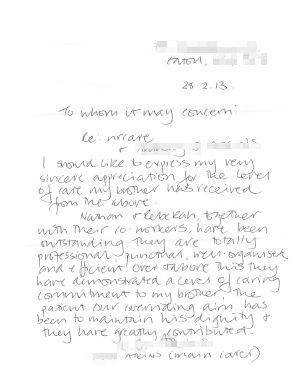 We always felt you treated (patient) with respect and maintained his dignity as far as possible. That was so very important to (patient) and to us. 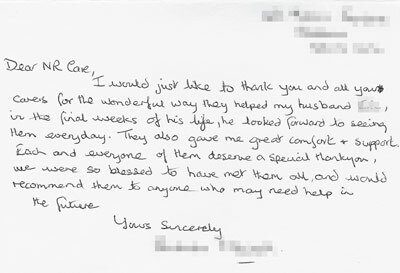 It helped so much that everyone who came into our home was happy and positive and so willing to “banter” with (patient) and join in with his sense of humour. The care and attention to detail was exceptional. Your visits ensure that (patient) remained comfortable but they were also a real tonic, often lifting our mood during such a stressful and exhausting time. We appreciated your flexibility especially during the last few days of (patient)’s life and the appropriate comfort you offered us when we were upset. We wanted to let you know you all helped us and that we are very grateful. Im emailing you following my dad’s passing on Sunday 11 May. 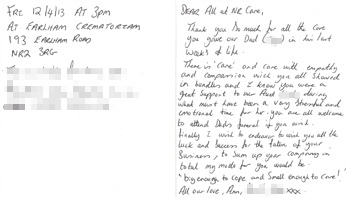 In the face of 9 weeks of often very adverse times, my family was supported superbly by your staff. 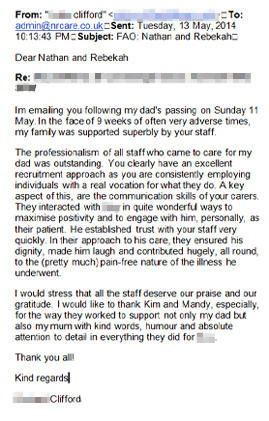 The professionalism of all staff who came to care for my dad was outstanding. You clearly have an excellent recruitment approach as you are consistently employing individuals with a real vocation for what they do. A key aspect of this, are the communication skills of your carers. They interacted with (patient) in quite wonderful ways to maximise positivity and to engage with him, personally, as their patient. He established trust with your staff very quickly. In their approach to his care, they ensured his dignity, made him laugh and contributed hugely, all round, to the (pretty much) pain-free nature of the illness he underwent. I would stress that all the staff deserve our praise and our gratitude. I would like to thank Kim and Mandy, especially, for the way they worked to support not only my dad but also my mum with kind words, humour and absolute attention to detail in everything they did for (patient). Sometimes life can get pretty tough. My husband suffered a severe stroke 5 years ago and has been cared for at home since then. For nearly 2 years his care was undertaken by a local company and the provision was dire. So dire in fact that, following a CQC inspection late last year, their report was so scathing that Social Services suspended them from their list of providers. In late November my husband was seen by a doctor who found him to be entering the last stages of life and the palliative care nurses were alerted. If this was not enough, the care company then withdrew their service. When the nursing team realised this they did, as if my magic, find NR Care for me. And my life changed – I can hardly say for the better since I am speaking of anticipated the death of a dearly loved husband. 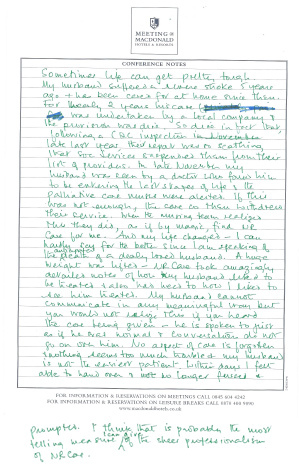 A huge weight was lifted – NR Care took amazingly detailed notes of how my husband liked to be treated and also take heed to how I liked to see him treated”. 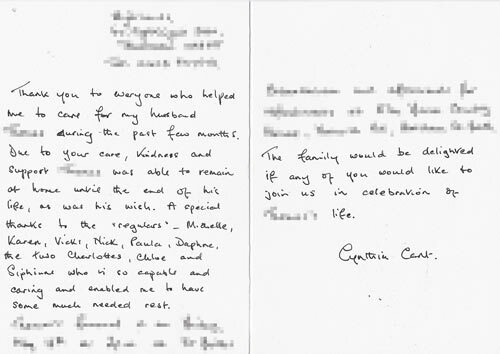 My husband cannot communicate in any meaningful way but you would not realise this if you heard the care being given – he is spoken to just as if he was normal and conversation do not go on over him. No aspect of care is forgotten and nothing seems to be too much trouble and my husband is not the easier patient. Within days I felt able to hand over and no longer fussed and prompted. I think that is probably the most telling measure I can give of the sheer professionalism of NR Care. Thank you so much for all the care you gave our Dad in his last weeks of life. There is ‘care’ and car with empathy and compassion which you showed in bundles and I know you were a great support to our aunt (private) during what must have been a very stressful and emotional time for her. You are all welcome to attend Dads funeral if you wish. 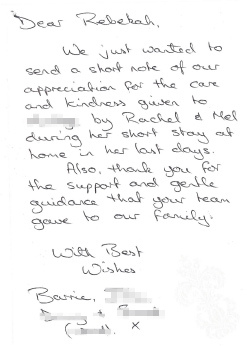 We just wanted to send a short note of our appreciation for the care and kindness given to (patient) by Rachel and Mel during her short stay at home in her last days. Also, thank you for the support and gentle guidance that your team gave to our family.